Painted fall pumpkins are all the rage at my house, well actually they’re pretty popular every where! Recently I painted the >> mirror and lamps, everything looks so light and bright in the foyer now. I had the paint left over from that project, the pumpkins are from the last couple of years. This was a very budget friendly makeover. 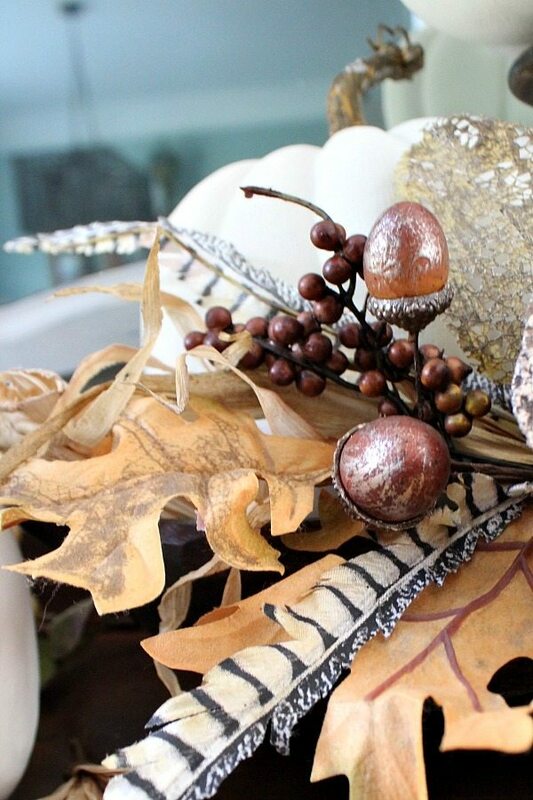 Muted colors of nature, seed pods, acorns and feathers finish the buffet arrangement. I love these big sprays of florals. It’s two large floral picks, all my favorite fall ingredients are included. Love the hints of gold on a few of the leaves and on the acorns. All I had to do was fluff it up and add a few corn husk sprigs. I placed the large cream colored berry picks in the back for filler. Now that I’ve painted my fall pumpkin stash, I wonder what color they will be next year! 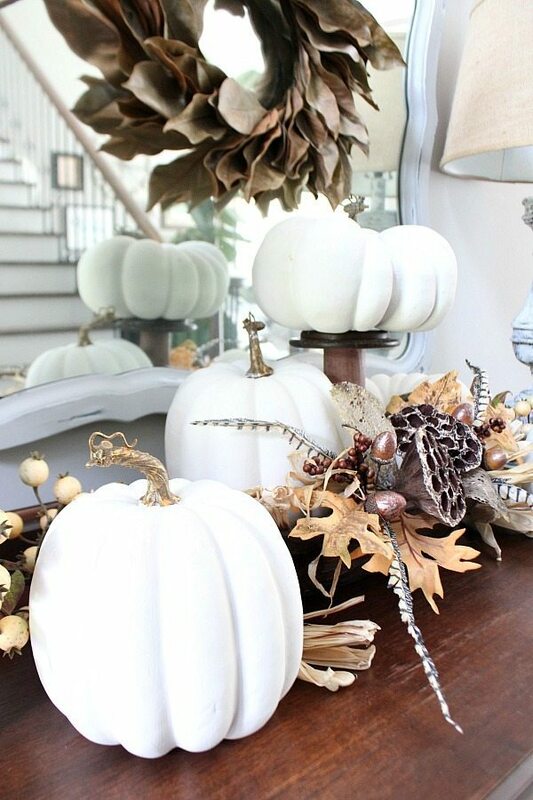 That’s one thing I love about faux pumpkins, they last forever. I’m thinking aqua for their next transformation! 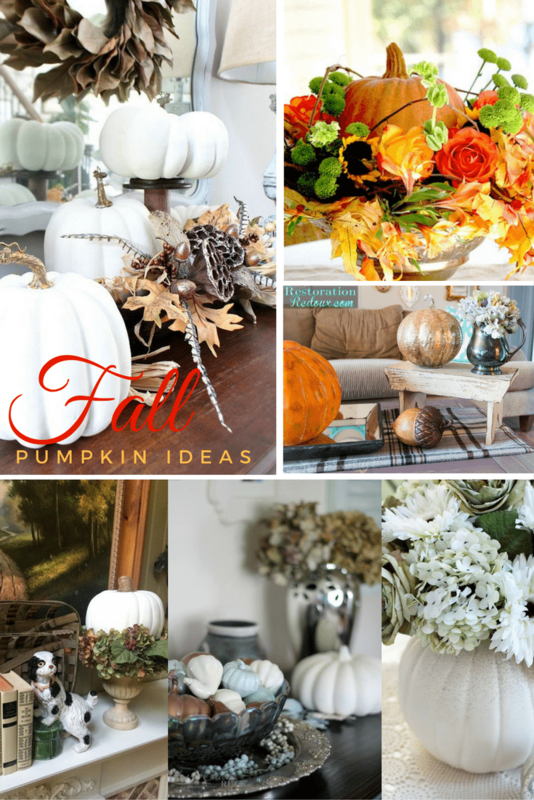 Click to join us and over 5K Decor Enthusiasts in our forum on>> Facebook and share your Fall Decor and more! I use my orange craft pumpkins outside in my garden for the fall season. refresh them. I hope the paint will last for several more years. one on the bottom. I use short thin metal post to hold them in the ground. These turned out so pretty! I wouldn’t of thought of painting them white. Nice change from the typical orange pumpkins. 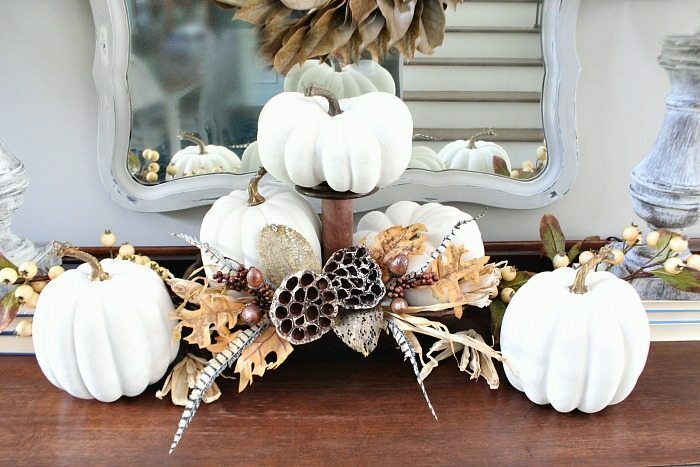 Lovely idea, so pretty and different than the same ole orange pumpkin, love this idea! I can’t wait to get some pumpkins—Yes I’m paintiung them white!!!! Guess what I’ve been doing for two day? Yup, painting pumpkins and more pumpkins. I think I might be on pumpkin overload…lol. I enjoyed your arrangement with all the white pumpkins! 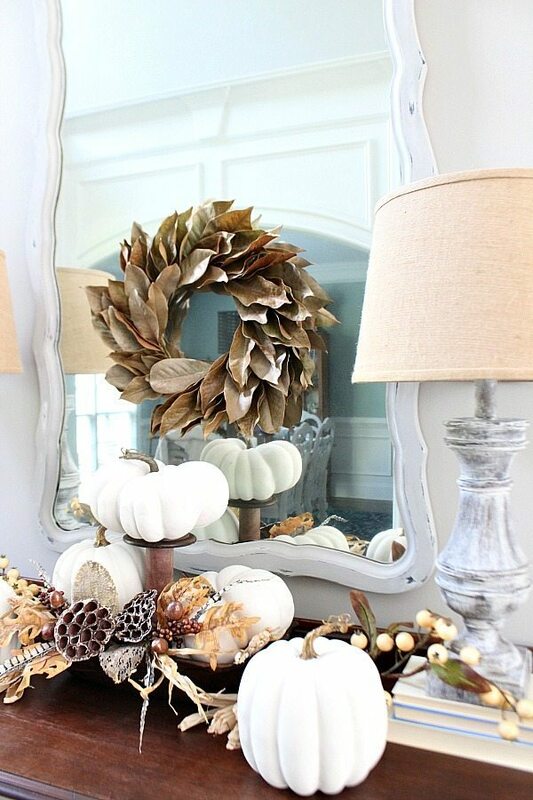 Love the white pumpkins! 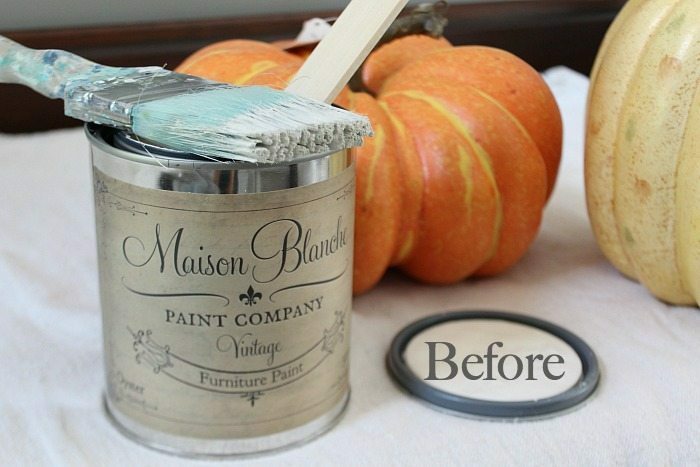 I’ve painted pumpkins for years long before it became popular and not in just one color or this kind of paint. Thanks for sharing. Love the ideas…. Great DIY ideas and easy on the budget. I love your white pumpkins! Your arrangement is so pretty, I hope I can somehow copy it. I’m ready to get all mine out and start painting! Beautiful. 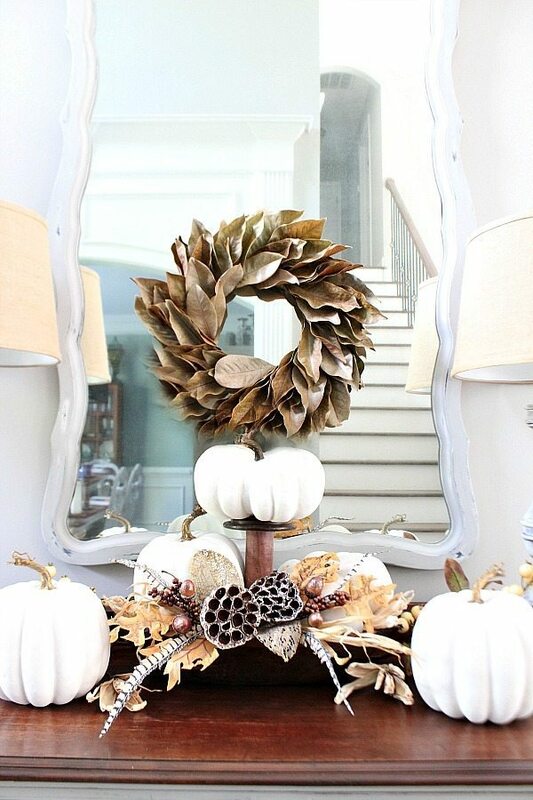 Fall is my favorite time of year for decorating. I typically decorate for fall instead of decorating for Halloween. This way it stays nice till it is time to decorate for Christmas. I love all the ideas. your pumpkins look so pretty how you have everything arranged. You know I have never painted a pumpkin. I probably have a few in my stash that could use a good touch up. I love the great ideas that you have shared!! Those pumpkins are gorgeous!! 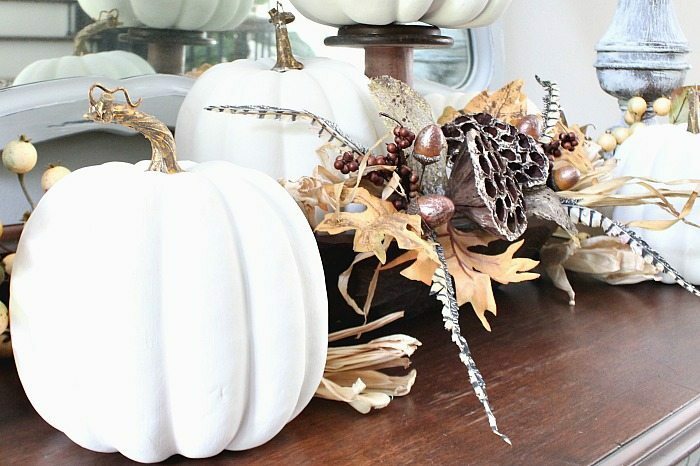 I absolutely adore the white pumpkins. Your styling iis perfect on the console. Can’t wait to get the paints out. Beautiful! 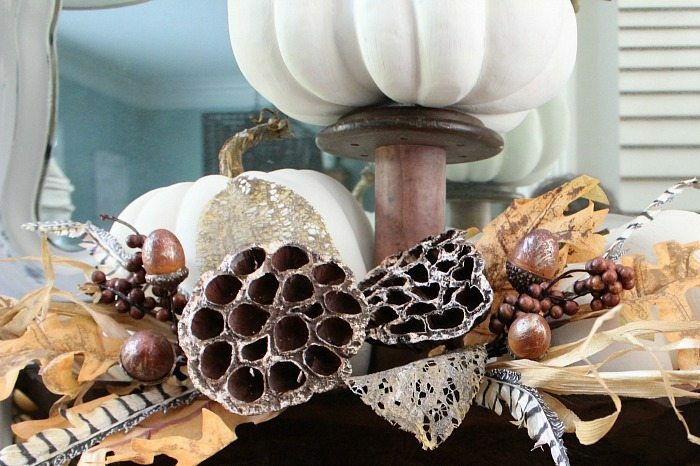 I can’t believe it is already time to consider Fall decor. What wonderful inspiration. Thanks for sharing. I really like the look of the painted white pumpkins but I’m always partial to a traditional orange pumpkin. Great post! 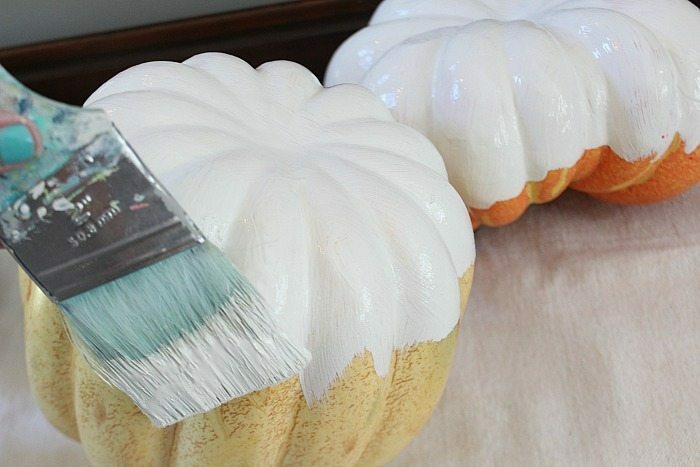 I never thought of painting pumpkins white. My next stop will be the Dollar store to grab up some pumpkins and goards. 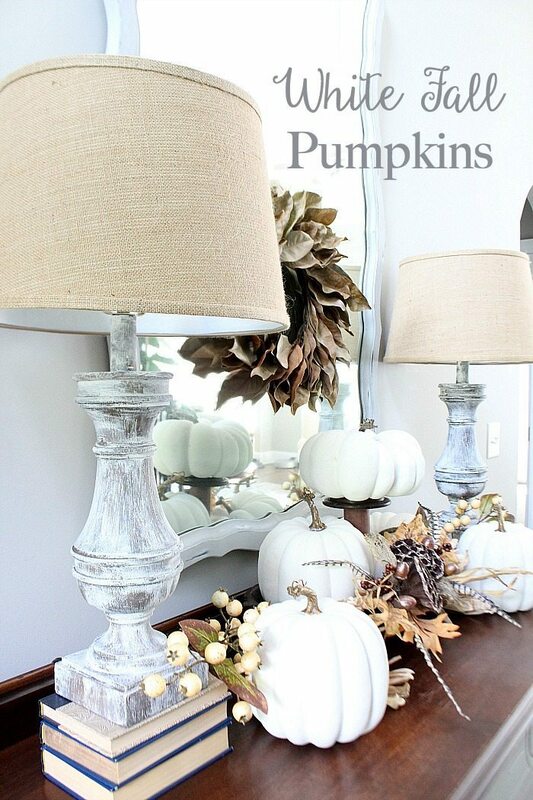 Love the white pumpkins! I also am crazy with the fake pumpkins- what great things you can do with them. Love the pumpkins. I’d also love to win this getaway! Thanx for so many good ideas with the pumpkins! Gorgeous my friend!!! I need to paint more of mine! That is absolutely stunning Debbie!! I love the neutrals!! Soo pretty Debbie! You stay so busy, I do NOT know how you do it all!! !